I’m giving you all a peek inside the one item I always have with me – my purse. And it should come as no surprise to anyone that my purse is filled with pink items! I try to rotate which purse I carry on a pretty regular basis; I have a lot of purses and am always looking for a new one! 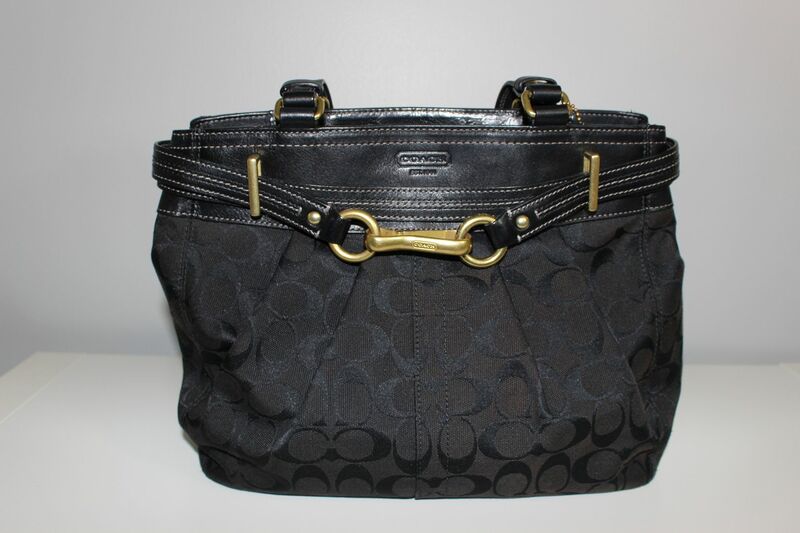 Currently I’m using my black Coach purse that was given to me as a bridal present. Um, yes please! I will gladly accept a Coach purse instead of kitchen appliances! 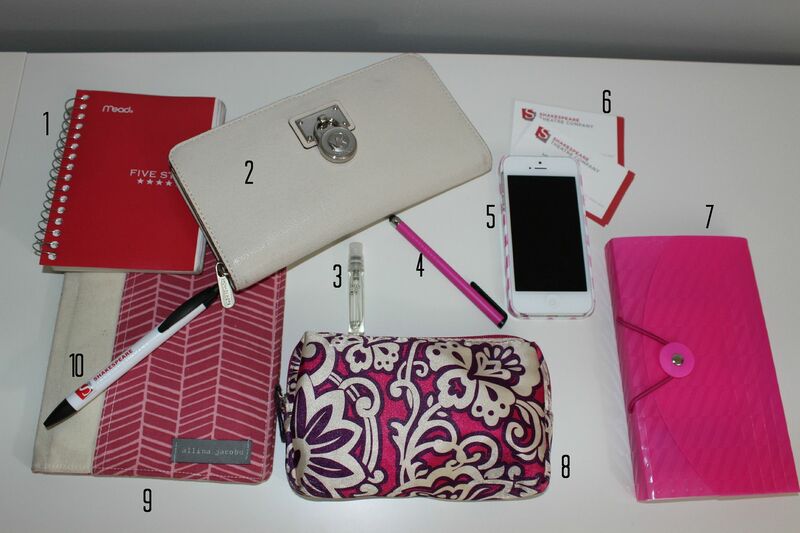 Here is a look inside my purse, enjoy the items that I carry with me on a daily basis. 1.) Small Notebook – I keep this with me to jot down shopping lists, blog ideas, to do lists, anything I want to remember. 2.) Michael Kors Wallet – One of my 30th birthday presents to myself was this wallet (I also bought a bag in the same winter white color). Even though I rotate my purse, I hardly ever rotate my wallet. 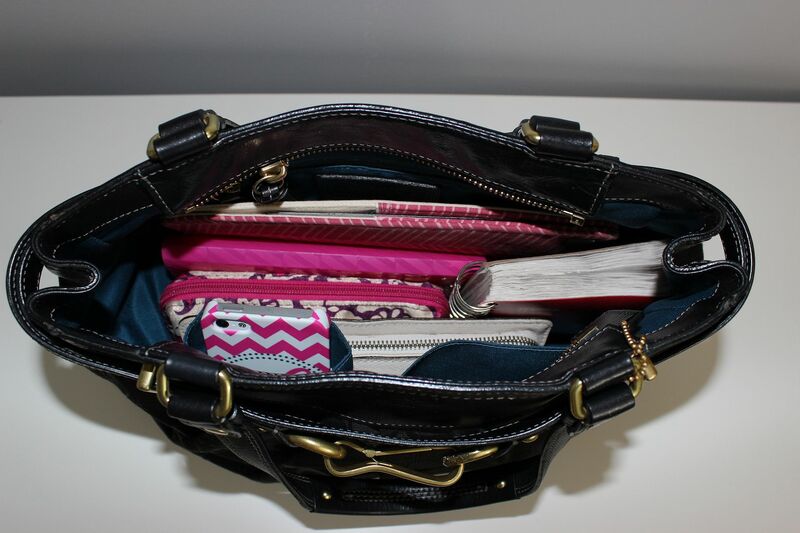 Plus this one has so many fab pockets for me to keep everything organized that I don’t feel a need for a new wallet! 3.) Skinny Chic perfume sample – This came in one of my Birchboxes and I just love the clean scent. I keep the perfume in my purse because the scent doesn’t last all day, so I like to have a quick refresher. 4.) Ipad/Iphone stylus – My Dad bought this for me after I commented that I really liked his. It’s great to use so you don’t get fingerprints on your screen, but I also like to use it while wearing gloves. That way I can still scroll through my phone without having to endure freezing cold hands. 5.) Iphone – I don’t go anywhere without this bad boy. Which is a good and a REALLY bad thing. Why are we so dependent on our phones? 6.) My business cards – I never know who I’m going to meet, so I always carry my business cards for the Shakespeare Theatre Company (I’m the Publicist) with me. 7.) Coupon Organizer – I found this in the $1 aisle at Target and I love it. I use it to keep my receipts, store coupons (like the millions of Bed, Bath and Beyond coupons I receive in the mail) and gift cards all organized. I always have this in my purse because I never know when I’m going to be somewhere and need a coupon or walk into a store where I happen to have a gift card. If I always have everything with me, I can use it whenever! 8.) Cosmetic Bag – Another Target find! This cute little bag contains my pressed powder, eye shadow, chapstick, several lipsticks, a small comb, bobby pins, hair ties and face blotting papers. Yep – all of that fits into one tiny bag! This is probably the most used item in my purse; a Southern girl has to keep up her appearance. 9.) Organizer from Allisa Jacobs – I hate having pieces of paper just thrown in my purse where they can get bent, so I bought this organizer from Allisa’s etsy shop. You should check out her shop, she has a ton of cute items! 10.) Pen – I absolutely love these pens from the Shakespeare Theatre Company. These are my go to pens, I use them for everything. I’m not sure what I love about them, but I have several pens at home, in my purse, in my car and at my work desk. So there you have it, these are my “essentials.” What’s in your purse? Why not leave a comment below or snap a picture and tag me on twitter (@lindsaytolar) so I can see what you have in your purse. I’m linking up with Carly over at Lipgloss and Crayons and Lauren over at Pink on the Cheek for their What’s In Your Purse link up. Everything in your purse coordinated so well! Mine is a giant sac that half of which is a diaper bag. So I have milk stains, animal cracker crumbs, board books and wipes always in it! GORGEOUS bag! And so neat!! You are SOO organized! Love the bag too, adorable! That organizer looks so cute- will have to check out her shop! I love to carry all my coupons/gift cards with me too and I never have room in my wallet for them. You never know when you'll need them! I am so glad you linked up and sharing your love for Alissa. I just went to her shop and its all so darling! Perfect bridesmaids gifts right there! You're so organized although I'm not surprised :) I love that paper organizer, I need one of those badly!! I have receipts and post it notes through out my purse. Excited to check out that shop!! Oh my your purse is darling so organized too! So excied to be your newest follower! I think our purses are almost identical inside! I also carry my MK wallet (in the same vanilla) in every purse. I love it! Mine is the zip around in the same size. I need to start carrying a makeup bag in my purse, I can never find my lipstick!